As Serena Williams walked off the tennis court 13 years ago after an exhibition match in Chicago, she paused to sign autographs for a group of fans. Among them was tiny Brienne Minor, who raised her tennis ball high, hoping for an autograph. Williams obliged, leaving the then-6-year-old ecstatic. Minor knows something about tennis role models — she had a few in her family. One sister, Jasmine, played tennis at Georgia Tech and will graduate next month from the Medill School of Journalism at Northwestern University. Her oldest sister, Kristina, was a standout tennis player at Illinois before getting her law degree at Marquette University. She is now the director of compliance at Rutgers University. Minor was always in tow as her parents, Kevin and Michelle, traveled the country taking the older daughters to tournaments. At the time, it was easy to placate her. Her parents, both engineers, would make sure they were well-stocked with chocolate and Marvel movies. Once Minor picked up a racket at about age 4, she was a natural. 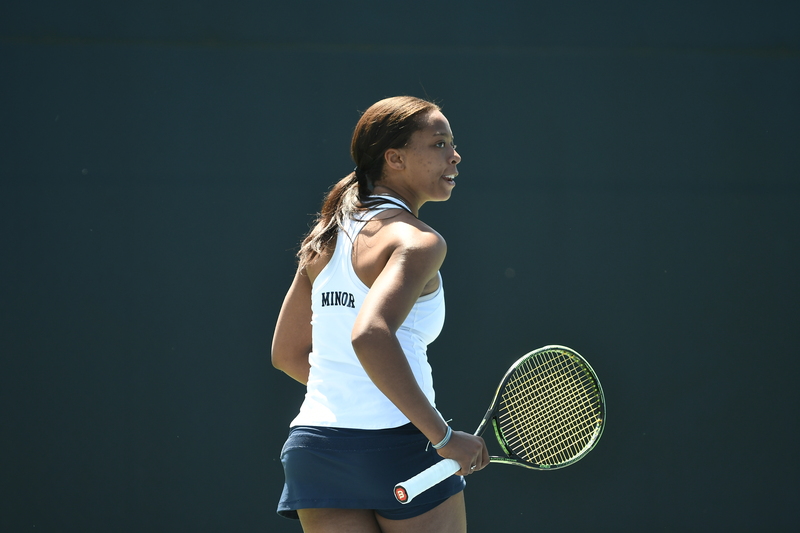 Brienne Minor of the Michigan Wolverine’s Women’s tennis defeats Youngstown State University in NCAA Regionals. That natural ability was needed last week, as Minor faced many challenges on the way to the title. She was unseeded and playing in the same bracket as the top seed. She was battling tendinitis in her knees. And her opening match was against Miami’s Sinead Lohan, who had ended Minor’s 2016 season in the NCAA singles competition. Despite dropping the first set and experiencing severe leg cramps in that first match, Minor won in three sets, 3-6, 6-3, 6-3. In the third round, Minor went up against Mayar Sherif from Pepperdine, who opened the tournament by easily upsetting the tournament’s top seed. Minor beat Sherif in straight sets. Kristina drove from New Jersey to D.C. on Thursday night to pick up Jasmine, and from there they drove 10 hours overnight to Athens, Georgia, arriving at 6 a.m. That’s where they joined their parents, who drove nearly 12 hours to Athens at the beginning of the tournament from their home in Illinois. They arrived just hours before Minor’s quarterfinal match against Sara Daavettila, who was the nation’s top high school player when she entered North Carolina in 2015. The two had played against each other in juniors tournaments over a span of seven years, with Daavettila winning “over 90 percent of the matches,” according to Minor. “That didn’t matter. By that time, I was on a roll,” said Minor, who beat Daavettila in straight sets, 6-2, 6-4. In the semis, Minor dropped the first set before rallying 6-7 (5), 7-5, 6-0 to set up Monday’s championship match against Belinda Woolcock of Florida, the tournament’s No. 6 seed, who had dropped just one set on the way to the finals. The final match was a breeze — a 6-3, 6-3 win — ending with Minor tossing her racket into the air on the winning point after a shot by Woolcock went long. In the stands, her father sat still, seemingly stunned, while Minor’s mother and two sisters cried with joy. Michigan’s Brienne Minor returns to Florida’s Belinda Woolcock in the final match of the NCAA women’s tennis championship Monday, May, 29, 2017 in Athens, Ga. Minor defeated Woolcock. Minor also found herself in a moment of disbelief as she ended her season on a nine-match winning streak, six of those coming in the NCAA tournament. One of three players at Michigan to earn two-time All-American honors, Minor became the first women’s tennis player in school history to win a national title. With the victory, Minor finds her plans for the summer altered. Her intentions were to give her sore knees six weeks of rest while she attended summer school in Ann Arbor, Michigan. 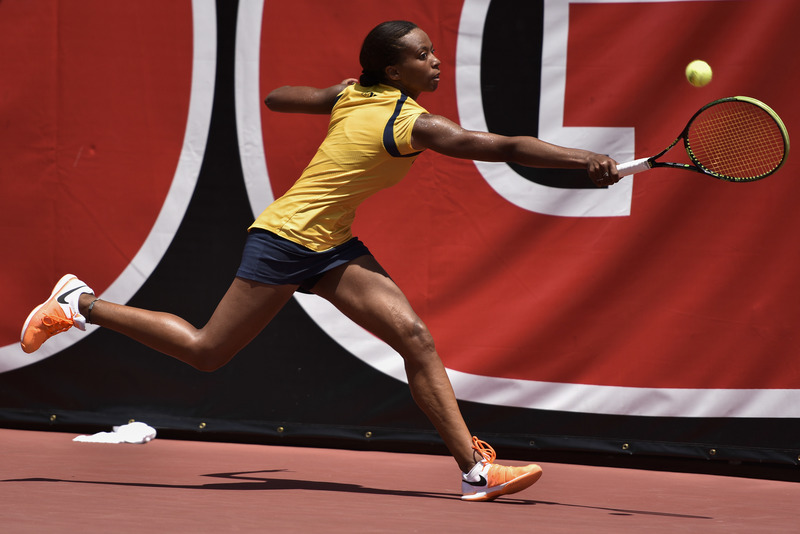 Instead, Minor will take a couple of weeks off before she begins to train for the U.S. Open, which begins in New York on Aug. 28. The winner of the NCAA tournament gets a wild-card entry. And the entire family is looking forward to being in the stands in New York, along with a loud cheering section. Chances are there won’t be anyone in that section prouder than her parents. “It’s going to be overwhelming,” Kevin Minor said. “As parents, you never know what type of job you’re doing until after you see some results. You live your whole life hoping you’re doing the right thing. With the success of all of our daughters, it makes us feel like we made the right choices.